When a gruff US media tycoon says: “Drop everything else and do that,” they’re not usually talking about a university sponsorship deal. But former Disney boss Michael Eisner, now owner of Portsmouth Football Club, is a passionate advocate of a partnership that will see the University of Portsmouth’s logo being unveiled on the team’s shirt later this month. Corporate sponsors might more often be airlines, online gambling websites, banks or financial services firms. But Portsmouth, a big club that’s faced tough times in recent years, is signing up with a university. And it’s not about the money, the club could have got much more elsewhere. Mr Eisner, speaking from New York, says he has “nothing against very commercial sponsorship” – but as soon as the university was suggested, he wanted to work with them “almost at any price”. The football club has a strong “emotional connection” with people in the city, he says – and he wants to use that influence to improve levels of education. “It instinctively felt right,” says Mr Eisner. It’s not really what you expect to hear from billionaire overseas football owners – but he wants his club to help improve the numbers of young people from Portsmouth going to university. The south-coast city has one of the lowest university entry rates in England. The city’s prosperity and attracting investment and better jobs will depend on improving levels of education – and Pompey’s owner sees it as part of the club’s civic duties to support this. “The club is so intertwined with the life of the city, more than most clubs. The health of the city is the health of the club,” he says. Mr Eisner says the university was initially hesitant about the partnership. But the vice-chancellor, Graham Galbraith, says that Mr Eisner “was not your traditional football club owner” – and the deal offered a rare chance to connect with communities that other access schemes were never going to reach. White working-class boys are the group least likely to go to university, but Prof Galbraith says these are “the backbone of the club’s support”. “We’re working with schools. But the fact is, whatever we’re doing, we’re not getting the message across to these communities in Portsmouth,” says Prof Galbraith. But now every youngster kicking a ball in a Pompey shirt is going to be wearing the name of the university. “It’s important to show that universities are in reach. We have to go where these kids are,” says Prof Galbraith. And he says bringing players to university open days and outreach events is going to have a big impact. He wants to connect with families “who don’t see education as important, people who think education is not needed”. The university is not disclosing how much the three-year deal is worth – but Prof Galbraith sees it as likely to be a one-off. If the club gets promoted back into the big time, he thinks the financial temptation for a big commercial shirt sponsor might be too much, so it’s a case of now or never. Portsmouth’s low level of university participation is out of keeping with the surrounding south of England – and Prof Galbraith describes it as “very much a northern city sitting on the south coast”. The football club has an authenticity and credibility for Pompey fans – and Prof Galbraith wants young people to see the university as part of the team they support. Mary Curnock Cook, former head of the Ucas admissions service, has highlighted the social divide in applications and particularly how it affects boys. “It’s the white working-class boys who are furthest behind. They are the group least likely to go to university – 54% fewer boys than girls from low-income backgrounds had applied through Ucas by March this year,” says Ms Curnock Cook. She backs the idea of using football – with Northampton Town also having a sponsorship deal with its local university. “Helping youngsters to see that football and education work powerfully together must be a good thing,” she says. The club has its own self-interests in the link with the university. Mr Eisner says there will be a “synergy” with the university’s sports science department, which could help with the team’s training. Will football fans see themselves as possible students? He also wants to cultivate the type of relationship familiar in the United States, where many universities have their own major sports teams. “As a student I remember toiling away and then looking forward to the big game at the weekend,” he says. There will be discounted tickets for the university’s students, which could widen the demographics of the club’s support. That also means upgrading the facilities at Fratton Park, the club’s ageing ground. It’s a classic, atmospheric, old-fashioned, bear-pit stadium, wedged into terraced streets. “Buckingham Palace isn’t modern, but you don’t say, ‘Knock it down,'” Mr Eisner says. But he says the traditional intensity of support shouldn’t prevent an “atmosphere that is safe and fun”. The club’s management were sent by Mr Eisner to Disney University to find out more about looking after customers. If football’s image is often associated with narcissism and conspicuous wealth, Mr Eisner says he wants a more responsible approach. He promises a “consistent, intelligent, long-term strategy”, building up the infrastructure and professionalism of the club, which a few years ago almost faced financial extinction. This means supporting the wellbeing of the city, with the university partnership intended to create a bridge between neighbouring institutions that can help each other. 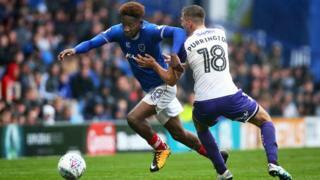 Portsmouth Football Club and the University of Portsmouth share the same crowded island, but the people going through their doors are often worlds apart. To borrow a title from another son of Portsmouth, Charles Dickens, it’s a tale of two cities.